Long distance dating can be difficult. When my husband and I first starting dating in 2005, we had to live in separate cities for the first several months as I had a job up north and he was finishing school in the south. I’d often send him long distance dating care packages just to let him know I was thinking of him. I remember one year I sent him a mini Christmas tree filled with ornaments that reminded me of him. We still have these ornaments and we put them on our Christmas tree every year. 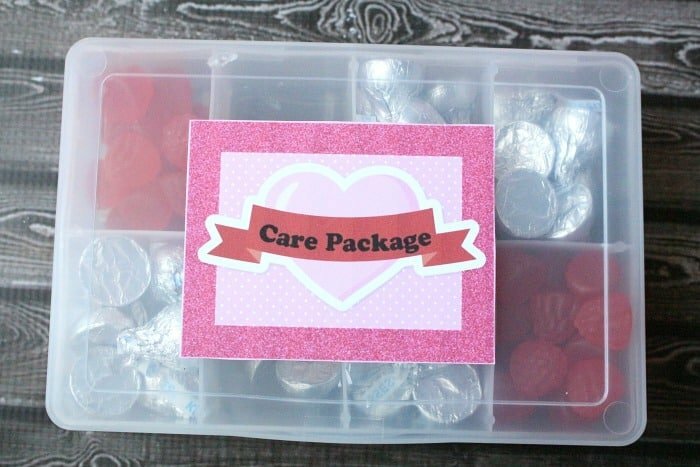 The idea for using a craft storage box came from this post by Angie over at Echoes of Laughter in her cute idea for a Valentine’s Day treat for a teacher. To make this care package, you’ll start with a small craft storage box from your local dollar store. What’s great about these storage containers is that the separators inside the box are removable so you can move them around to fit your needs. To make this idea even more cute, add a piece of scrapbook paper (with permanent double-sided tape) to the front along with a sweet message and your special someone’s name. Now you get to fill the box with treats that remind you of your special someone. 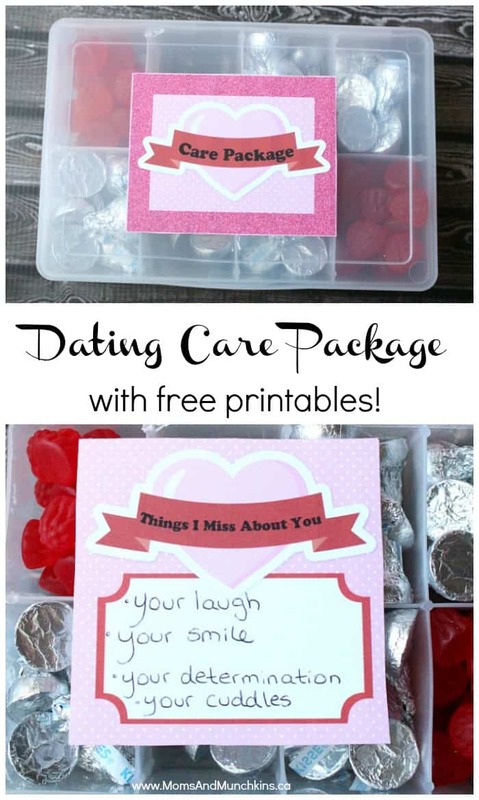 We also have free printables for “Care Package” and a “Things I Miss About You” notecard. Have you ever sent long distance dating care packages? If so, what did you include? For more date ideas and FREE printables, check out our Date Night page. Stay updated on the latest ideas by following along on Facebook, Twitter, and Pinterest with sneak peeks on Instagram. *A special thanks for our designer Wendy’s Printable Party plus Erin Bradley Designs for the adorable clipart.